Dr. Paul Campbell showcases the applicability of CorPath GRX in complex multi-vessel PCI via left radial access. See the benefits of guide catheter control and precision in action and understand how vascular robotics can enable increased utilization of left radial to benefit patients with previous CABG, right subclavian artery tortuosity and for patients that are right hand dominant. Physicians at UCSD looked at 40 subjects and 53 lesions, the majority of which were complex B2/C. The outcome showed that second generation CorPath GRX for robotic-assisted PCI is safe, effective and achieves high rates of clinical (97.5%) and technical (90%) success in a cohort of patients with complex CAD. Dr. Rao presented the first study to investigate an advanced robotic wiring function, Rotate on Retract (RoR) in robotic PCI. It was found that the use of RoR was associated with significantly reduced wiring time and less variability between operators when compared with current robotic PCI methods. In a Challenging Case presentation, Dr. Campbell highlighted a case where he employed the floating wire technique using CorPath GRX. The outcome was successful stenting of the ostium of the RCA via transradial access. The outcome concluded that second generation vascular robotics enables guide catheter support and control for use of Robotic PCI in complex lesions. 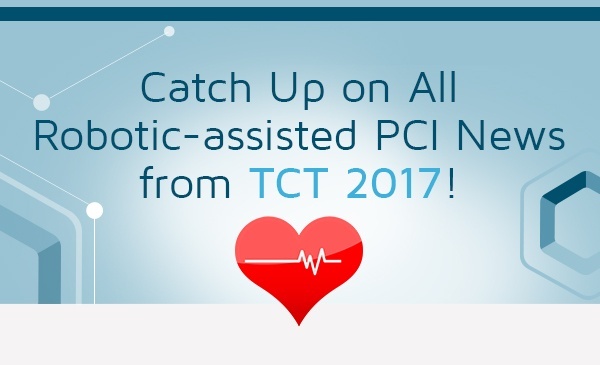 The REMOTE-PCI Study explored feasibility of remote tele-stenting using a robotic system. The study showed 86.4% technical success and 95% procedural success. Further research is necessary to identify and overcome challenges. Robotics has the potential to increase access to care through future remote applications. *This study, conducted under local IRB, may involve off-label usage and was not sponsored by Corindus.